Life introduced to me to crepes only recently, when I lived in Los Angeles. My roommate had a French boyfriend that made crepes at our apartment–pretty much 24/7. So wonderfully typical of the French. I always wished he’d just make crepes in a black beret and a horizontally striped shirt, and let me sharpie a curly mustache on him. He refused. Sigh… such is life. Since I’ve moved to the district, however, I’ve started a Sunday morning ritual with my roommates (and the friends who frequently spend the night). Our kitchen has turned into a haven for crepe experimentation–plowing through whatever ingredients that could lead us to the perfect sweet crepe that can either make or break your hangover. This morning, though, I decided to take the experimentation to the next level. You see, last night was our first soiree with me living in the house. I stumbled into the kitchen this morning to find some dwindling bottles of dark rum, which brought me back to my college days in Westwood… not only because of the excessive drinking, but because back then we were lucky enough to have a Frenchman to make crepes en flambe (is that right? I don’t speak French) with our rum stockpile. 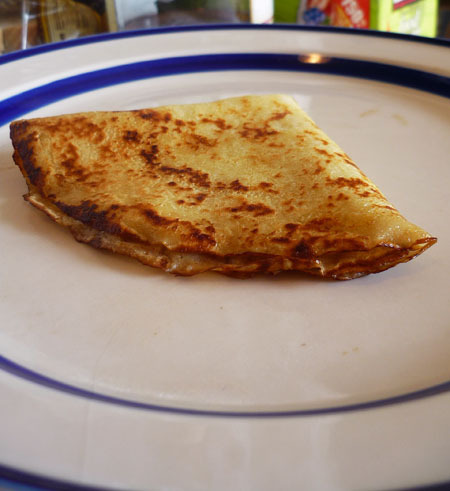 Crepes are traditionally cooked on one side only–but if you pour alcohol on top of it as it cooks, and then light the alcohol on fire, the surface of the crepe cooks as the alcohol burns away, and therefore caramelizing the sugar you sprinkled on top. If you don’t like egg nog, substitute the egg nog for more milk. If you can’t use almond flour, substitute all-purpose flour. 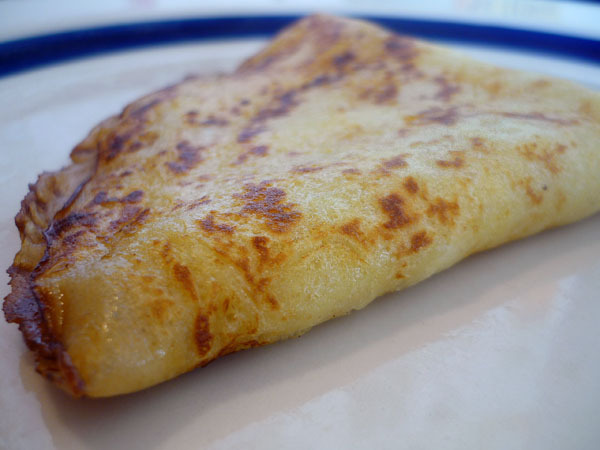 If you’re short on ingredients to put in the crepes, regular shredded mixed cheese and sugar is a personal favorite of mine–you would not normally expect to mix the two, but trust me on that one… it’s epic. First, you might be wondering what almond flour is. You can buy it at specialty stores, but it’s actually cheaper to make it. (Almond flour is one of the main reasons why I bought a Cuisineart food processor). Almond flour is actually quite simple to make–you just grind almonds in a food processor until it forms a light, fluffy consistency. It probably will never be as fine as all-purpose flour, but you want it to be fine enough to blend into a mixture without being lumpy. Anyway, almond flour is a staple I keep in my kitchen. It gives a good almond flavor to practically anything. Once you have that, stir together the almond flour, all-purpose flour, milk, water, and egg nog in a mixing bowl. Then, stir in the eggs and melted butter. When the mixture is even and smooth, heat a large non-stick frying pan over the stove, and pour the desired batter amount in the pan after it is already hot. You can pick up the pan and tilt it whatever way you need to in order to let the batter spread out–I personally, prefer my crepes to be as thin as possible. But use your judgment, and welcome experimentation into the kitchen. P.S. Why is my layout in Spanish? Told ya, I’m still working out some bugs.